VMware Workstation 11.0 running with nested ESXi 5.5 U2 (Build 2403361), vCSA 5.5 U2e (Build 2646482) and nested NSX Manager 6.0.4 (Build 1752381). NSX Manager installed and integrated with vCenter Server, IP Pool configured, one NSX Controller installed, Host prepared, Logical Network prepared, Logical Switches configured. Complete the DLR deploy process. DLR Control VM is deployed and powered on. 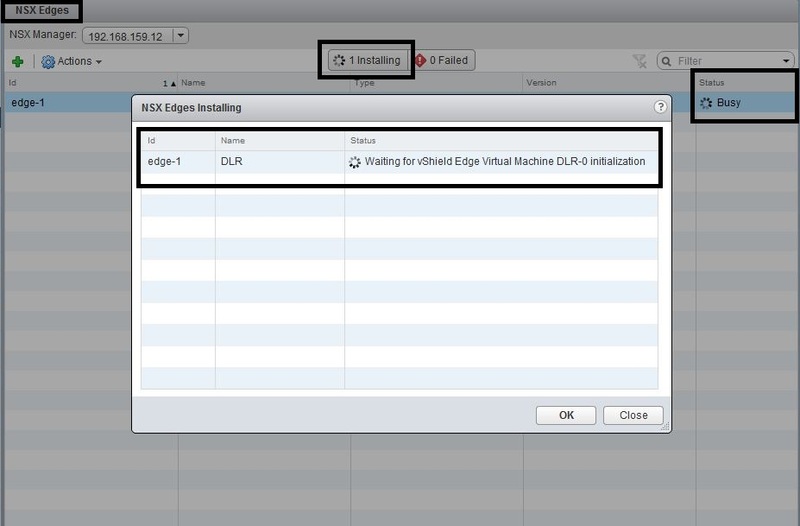 NSX Edge Install status is “Waiting for vShield Edge Virtual Machine <DLR name> initialization”. From the DLR Control VM console, the “show configuration” command displays a null configuration. After 10 minutes the DLR Control VM is deleted and the NSX-v DLR object is removed from inventory. NSX Manager log shows the message “Timeout while waiting for Edge initialization. It may happen if edge vm failed to boot because of resource constraint or failed to communicate with edge vm. Please refer to log for details”. Note: ESG deployments will complete successfully, only DLR will fail. This problem also occurs with NSX-v 6.1.0 and 6.1.3 (with ESXi 5.5 U2). Note: This problem does not occur with vSphere 6.0 and NSX-v 6.1.3. Download the latest ESXi patches manually or via VUM. Power off the NSX Manager and NSX Controller VMs. Upgrade the ESXi 5.5 U2 host from Build 2403361 to 2638301 using VUM or the command “esxcli software vib install -d “<path>”. Exit maintenance mode on the ESXi host. Power on the NSX Manager and NSX Controller VMs. Once NSX-v is operational, the DLR deploy process should now complete successfully.